On long trips, it's important to keep the backseat entertained and the driver comfortable. 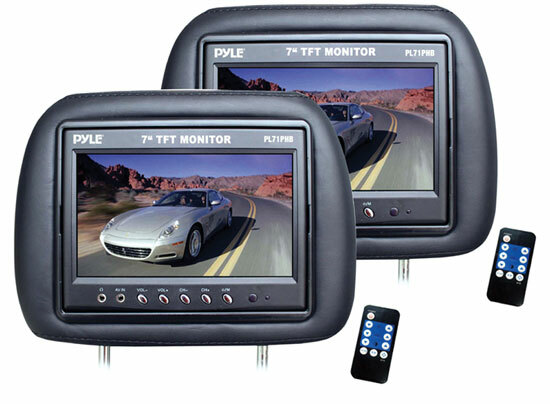 That's where this pair of black adjustable headrests with built in 7'' LCD monitors comes in. The picture on the screen is bright, crisp and accurate, thanks to the 1440x234 resolution, 300:1 contrast ratio, 25ms response time, and 16:9 display ratio. These take two standard RCA inputs, so you can hook up your DVD player, video iPod, or video game console with ease. A full function remote control provides complete wireless access to your monitor's settings. The kids will enjoy themselves in the backseat and you'll be comfortable and safe in the front knowing a headrest will protect you. Use the built-in speakers, or IR wireless headphones, so you can enjoy peace of quiet while the backseat has a blast. Best of all, these headrests are easy to install, and fit in many car and SUV models.